Penelope got married. This was a news that is no longer news because I was reluctant to share it. Penelope the goddess (see other duck stories) married her stalker. 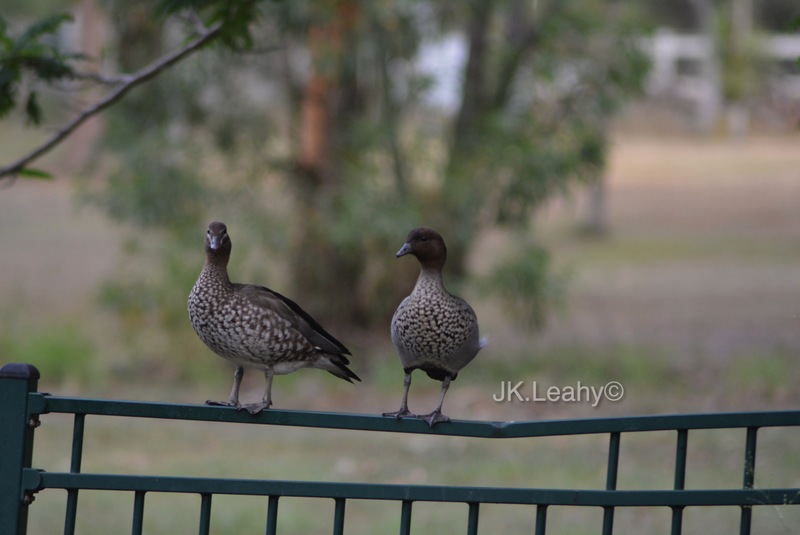 The male duck (pictured with her) lurked around our backyard for weeks as she was growing up last year. He has a tall slim body and deep grey feathers. His head was the darkest amongst all the other ducks. I had not seen him before Penelope was born. I think I kept chasing this male duck away because subconsciously, I believed he would take her away. None of my threatening moves scared the duck and I was surprised by its persistence to stick around. Each time I yelled at it, I was scolded by my sons. They argued that the male duck could be Penelope’s father. “Oh really, you’re serious?” I would say, knowing the duck wasn’t her father. The dark headed stranger would wait in our yard, in nearby trees and bushes and watch her. I had a name for it, but this blog is G rated so I won’t say it. As she got older, Penelope became silly and stubborn. Her behaviour changed in the evenings, she wanted to stay up and outside the coop. This is the story of Penelope, the baby duckling we raised. I guess I could not say Penelope grew up, got married and lived happily ever after. Not yet, as her story has not ended. Pictured here the feathered couple sat away from the pack and watched the new ducklings swim. “I am afraid they are getting new ideas”, I said to my own children. “Mum, stop messing with duck-business”, my son Nathan said. Standing under the hot Brisbane sun, I watched Penelope and thought of her when she was tiny and had a broken foot. She grew up too quickly and being able to fly in November last year, she left home and disappeared for a few days. Then she returned home with ‘him’. I was not impressed at first, but after a while, I watched the way they spent the day and it melted away my anger. The male duck serves the goddess with his love and patience. Penelope is very demanding and seems to bark orders at him. He obliges and keeps calm. Most times, he just follows her. Yesterday, she took him to my second garden near the neighbour’s yard. None of the other ducks go there and I was surprised to see the pair. But, that was where she and I used to spent most times; me pulling out weeds and she eating them. I am okay with them spending time in my garden. She is happy and she is still here in Bellbowrie and that makes me happy. I was laughing as I wrote this story, but I did get really annoyed in the beginning with Penelope and this male duck. If you think this post is ridiculous, say so, but I needed to get it off my chest. Ating yu na pato ting ting wun kine. Hahaha – wheesh yu tu ya. I thought it was adorable. It shows how attach we can get to animals, :). Aw, that’s very sweet of you. Thank you!